GNC Super Collagen+C Tablet is 100% pure collagen protein that provides the major building materials for growth, repair and maintenance of a healthy body. When it is taken internally, the body receives the raw materials it needs to supplement and repair collagen found in all of these areas. Super Collagen is enzymatically processed into its amino acid form with a very low molecular weight, which can be utilized 100% by the body. 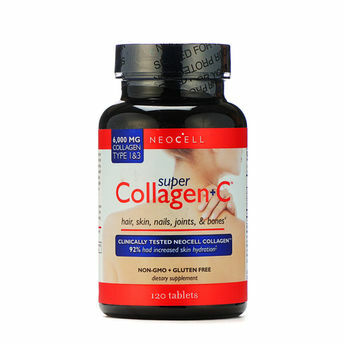 These tablets are formulated with Vitamin C to provide optimum supplementation of your dietary collagen needs.